What do you think is a working drawing? A working drawing is an engineering drawing that provides all the information necessary to manufacture an object or a part and it is divided into two general classes: Assembly Drawings and Detail Drawings. What information do you think has to be included on a working drawing? Explanatory notes (both general and specific) on the object or part; for examples notes such as material, heat treatment, finish etc. A parts list or bill of material. MAIN ASSEMBLY DRAWING : the main assembly drawing shows a finished object, indicating all it component parts and how all the component part relate to each other. Note that only principle dimension dealing with assembly or installation are included on the main assembly drawing. SUBASSEMBLY DRAWING : the subassembly drawing shows two or more parts joined together in the shop assembling procedure to form a unit of an object or piece of equipment, which is not itself a complete assembly. DETAIL DRAWING : a detail drawing describes an individual part and contains all the information necessary to manufacture said part. Where is the Title Block located on a shop drawing? 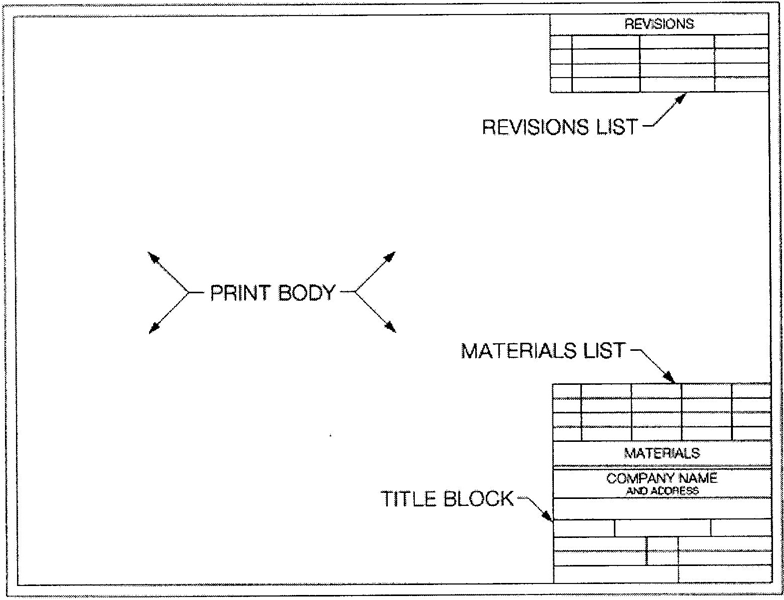 A title block is necessary because an engineer or draftsperson must provide essential information without adding to the complexity of the drawing. This information is vital and must be place on the drawing where it can be accessed easily and clearly and this is where the title block becomes useful. Thus a title block contains information not directly related to the construction of an object, but which is necessary for its manufacture. What kind of information do you think is contained in the Title Block of a drawing? 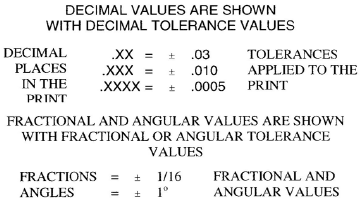 The following are typical decimal, fractional and angle tolerance values: Note you must always refer tolerance information and NEVER assume any tolerance. 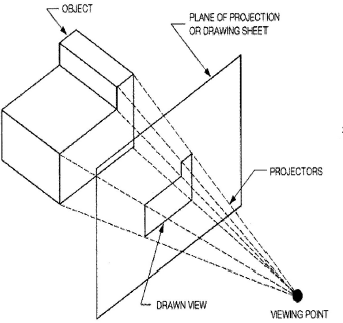 In central projection, the projector converges to a point; this point represent the eye of the observer. The result is that the size of the view varies depending on how far away the observer is for the object. 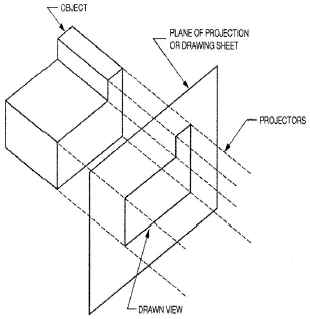 Because central projection distorts the actual shape of the object or part, it is not used in engineering drawings. Parallel projection does not have a converging point, instead the projector remains parallel to each other. This type of projection gives the true size and shape of the object. Because the size of the object is not compromised in these types of projection they are primarily used in engineering drawings. Orthographic projection are almost always used to make detailed drawings. All lines that are parallel on the object are parallel on the drawing. Hidden Lines: Hidden or invisible lines, consist of short evenly spaced dashes, outline hidden or invisible surfaces. Center Line: Centerlines consist of alternating long and short evenly spaced dashes, with a long dash at each end and short dashes at point of intersection. Phantom Lines: Phantom lines are thin lines used to indicate alternate position of the parts of an object, repeated detail, or the location of absent parts. Dimension Lines: Dimension lines are short, solid lines that indicate the distance between two point on a drawing. They terminate with arrowheads at each end, and are broken to insert dimension. Leaders: Leaders or leader lines indicate the part or area of a drawing to which a number, note, or other reference applies. They are thin, solid lines and usually terminate in a single arrowhead. 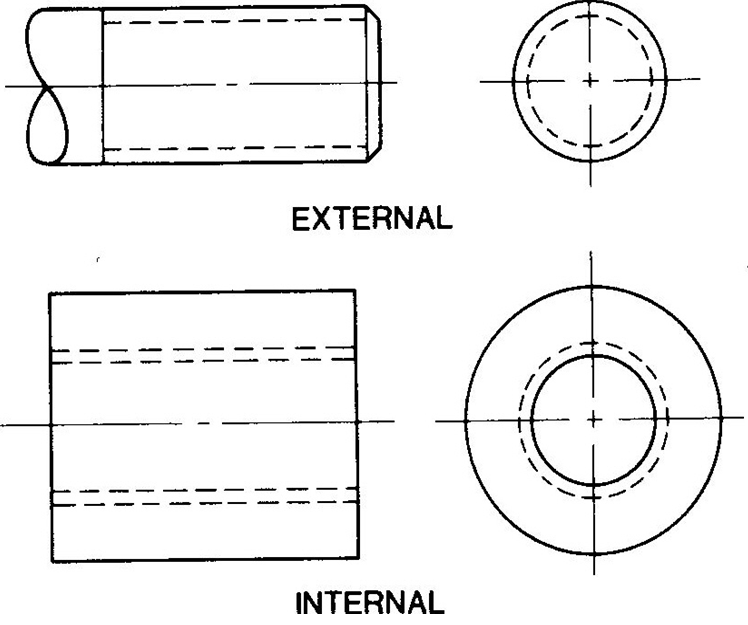 Break Line: Brake lines indicate that a part is broken out or removed either to (1) show more clearly the part or parts that lie directly below the broken out part (2) to reduce the size of the drawing of a long part having uniform cross section so tat it can be shown on a smaller sheet. Section Lines: Section lines or crosshatch lines distinguish between two separate parts that meet a given point. Having said this, section lines are used to depict a particular type of material. 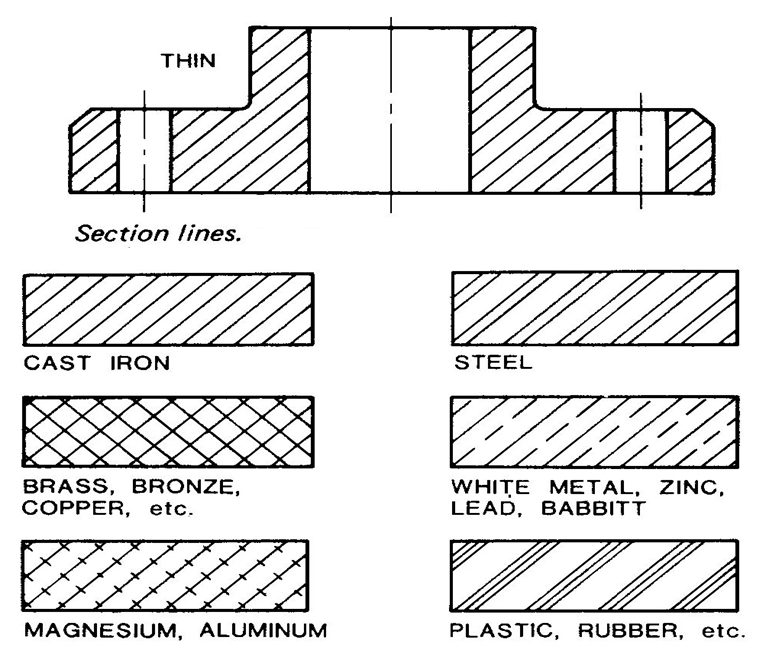 In assembly drawings, where many kinds of material may be used, individual parts may be crosshatched with the symbol for a particular material. Cutting Plane Line: a cutting plane line consists of a heavy dash followed by two shorter dashes. At each end, it has a short line at right angles to the cutting plane line terminating with arrowheads pointing in the direction from which the cut surface is viewed. A sectional view is obtained by imagining that a portion of the object has been cut away to expose internal lines and surfaces. The path of the cut is considered the cutting plane. Full section: A view obtained by passing the cutting plane across the entire object exposing the whole inner surface. Half Section: A half section view is obtained by passing a cutting plane at right angles to each other along the centerlines of symmetrical axes of the object; thus exposing one-half of the inner surface. Broken-Out or Partial Section: At time it is necessary to show a single detail, or a related detail which exist in the interior of the object. If only these details (internal) are all that is needed then the broken-out section view is used. Rotated or Revolved Section: A rotated section is made directly on one of the principle exterior outline view of the object, these may be bars, ribs, webs etc. Note the cutting plane passes perpendicular to the centerline of the part to be sectioned. The resulting section is then revolved 90 degrees into the plane of the paper. Removed or Detail Section: These view are similar to rotated section but are detached from the object and positioned along the center line of the object. 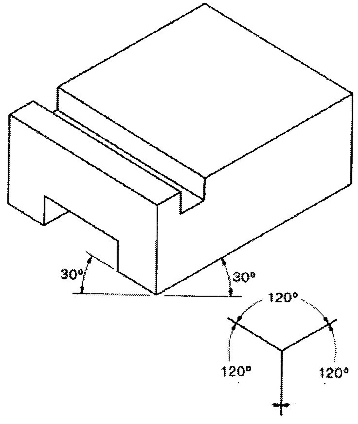 Offset Section: When a single cutting plane is not possible to produce a sectional view, then several cutting planes are employed in different directions to cut through the object. Angular Section: Angular section show detail of an object where the cutting plane used is not 90 or 180 degrees. Single Auxiliary View: A single auxiliary view is made by projecting the inclined surface in a plane parallel to it and perpendicular to one of the regular plane. This enables the viewer to see the surface as it actually appears when from 90 degree angle. Thin sections, such as sheet metal, structural shapes, packing gaskets, etc. are shown as solids in a sectional view. That is they have narrow spaces left between the thickness of these parts. When a part is sectioned in more than one place, the spacing and direction of the cross-hatching is the same in all sectioned area. When two adjacent parts are shown in sectional view, their cross-hatching are in opposite direction. When three adjacent parts are in section, two of them will have 45 degree cross-hatching in opposite direction. If cross-hatching using standard angles would appear nearly parallel to an object line of the part, then different angles must be used. 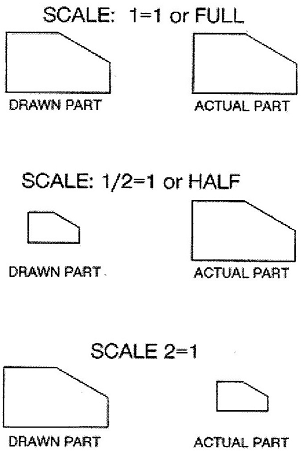 Invisible object line and details behind the cutting plane are not shown on sectional views unless they are needed to clarify the drawing. 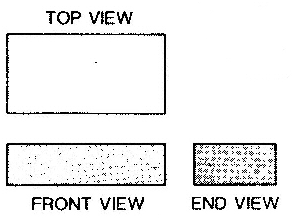 When a cutting plane passes through a rib, web, or similar parallel portion of the object the cross-hatching is omitted from those portions. In such cases, the cutting plane is seen to pass just in front of the rib or web. What is the definition of a machine tool? A machine tool is defined as a piece of equipment driven by an electrical motor. What is the definition of a cutting tool? A cutting tool is defined as a high alloy steel machined to a form which will facilitate metal cutting. Provide simple, easy to operate tools for maximum efficiency. Reduce manufacturing expenses by producing parts at the lowest possible cost. Design tools that consistently produce parts of high quality. Increase the rate of production with existing machine tools. Design the toll to make it foolproof and to prevent improper use. Select material that will give adequate tool life. Provide protection in the design of the tools for maximum safety of the operator. What is a “Production Plan”? A production plan is an itemized list of the manufacturing operations and the sequence of the operation chosen by the process planning engineer. What do you think are the requirement to become a tool designer? The ability to operate machine tools, read blueprints and is able to make mechanical drawings to full scale. A jig is a device that guides a cutting tool used in a machining operation. It can hold or support a workpiece if necessary. Drill jigs are used to drill, ream, tap, chamfer, counterbore, countersink, reverse spotface or reverse countersink. Template jigs are normally used for accuracy, but not speed. They fit over or onto the workpiece, but are usually not clamped. They are inexpensive and simple, and may or may not have bushings. Plate jigs are like template jigs, but have built-in clamps to hold the work. Plate jigs sometimes have legs and are then called table jigs. Sandwich jigs are like plate jigs, but with a back plate. This is advantageous to keep thin materials from warping. They may or may not have bushings and may have locating pins to locate the plates to one another. Modified angle-plate jigs hold parts at angles other than 90 degrees. Box jigs, or “tumble jigs” totally surround the part and allow the part to be machined on every surface without repositioning the jig. Channel jigs are “C” shaped. They hold a part on two sides and allow machining on the third side. Leaf Jigs are small box jigs with a hinged leaf to allow for easier loading and unloading. 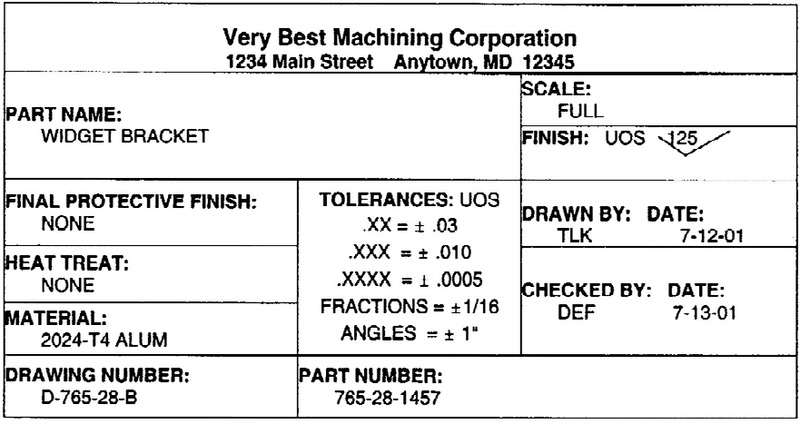 Fixtures are classified according to the machine on which they are used. A fixture designed for use on a milling machine is a milling fixture. A fixture designed for use on a straddle mill is a straddle-milling fixture. Generally speaking, fixtures are larger, heavier and stronger than jigs. Plate fixtures are made from flat plates with locators and clamps. They are simple, adaptable and very popular. Angle-plate fixtures are a variation of plate fixtures where the part is machined at a right angle to the part locators. Modified angle-plate fixtures can be used when other angles are needed. Vise-jaw fixtures are used for small parts. Standard vise jaws are replaced with jaws formed to fit the part. These are the least expensive type of fixture to make. Indexing fixtures are similar to indexing jigs. Multistation fixtures are used for high production runs where the machining cycle must be continuous. The simplest type of multistation fixtures are duplex fixtures and are designed to hold two parts. As one part is being machined, the other can be reloaded. Duplex fixtures can be made to rotate between cycles. Profiling fixtures are used to guide tools around irregular contours. The key to jigs and fixtures is the alignment between the cutter and other tools relative to the part that has to be machined. Jigs and fixtures are designed to hold, locate and support parts ensuring that the part is drilled or machined to specifications. A blueprint is a technical drawing, or a paper reproduction of a technical drawing, documenting an architecture or an engineering design. In the machining industry it details the design of machined or manufactured parts. Generally, “blueprint” is the term used that refers to any detailed plan. Upper Tolerance Limit: A given dimension with the “+” tolerance added to it. Bilateral Tolerance: A tolerance given as a “+” and “-” dimension. Bilateral tolerances do not have to be equal in each direction. Unilateral Tolerance: A tolerance given in either the “+” or the “-” direction. Line Types: Different lines have different meanings. Object Lines: Heavy, solid lines to indicate visible edges. Hidden Lines: Short dashes to indicate hidden features. Dimension Lines: Thin, solid lines with arrow heads showing the distance being measured. Extension Lines: Thin, solid lines that extend from a feature without touching it. Center Lines : Thin, alternate long and short dashes. Not part of the object, it indicates the centre position of a feature. Leader Lines: Similar to a dimension line, it points to a surface and calls out a dimension. Break Lines: Used to remove redundant information to save space on blueprints. Freehand Break Lines: Used to indicate short breaks. Ruled/Z Lines: Used to indicate longer breaks and are the more common of the two. Symbols: Different symbols have different meanings. Diameter (ø): Indicates the diameter of a round feature. Radius (R): The letter “R” is used to indicate the radius of a round feature. 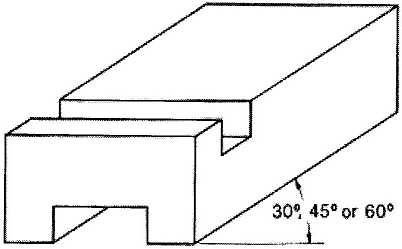 Chamfers: Note that when indicating a 45º chamfer, the distance given is the distance from the edge of the part to the start of the chamfer. Represents the part in a three-dimensional view. Aids the blueprint reader in interpreting the drawing. This is a means of representing a part with separate, two-dimensional views. A basic blueprint can have a top, front and side view as indicated in the illustration. More views can be added, such as bottom, left and back views. Orthographic views, when properly done, are “hinged” as is the home drawing to the left. Within this exists the textbook “Top, Front, Right” views that serve as a basis for many Blueprints. An auxiliary view is a view that represents the true size and shape of an inclined surface. Auxiliary views are added to drawings when it is impossible to show true shapes in standard, orthographic views. A partial auxiliary view is an auxiliary view in which only the details of an inclined surface are represented. A secondary auxiliary view can be projected from a primary auxiliary view to show true shapes and locations of part features. Secondary auxiliary views are often required when there are two or more inclined surfaces in a blueprint. A full section view results from an imaginary cut through the entire length of a part. The imaginary cut is the cutting plane line, labeled as “AA” to the right. Sectioned surfaces are indicated by a series of solid, slanted lines. A half section view results from an imaginary cut through a portion of a parts length.